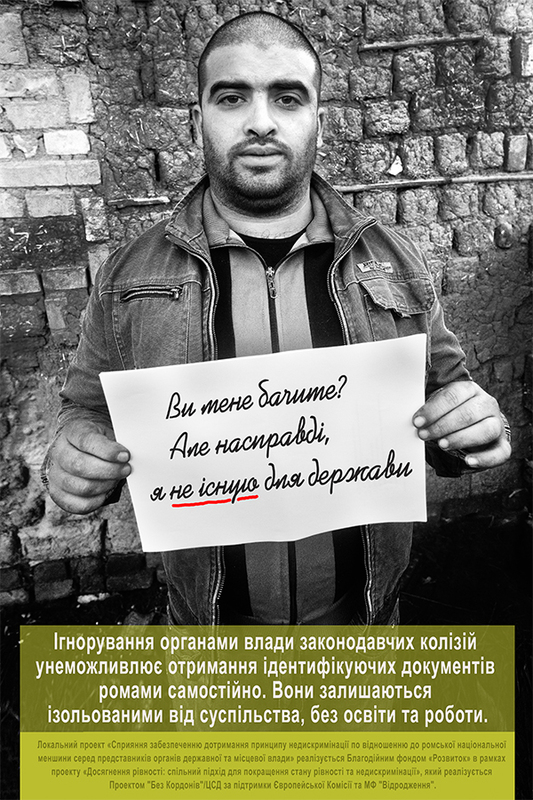 Within civil society advocacy campaign for elimination of legislative disagreements in issuing identity documents to members of Roma minority that started in October, 2015 employees of Fund “Progress” developed social advertizing to draw attention of citizens and especially authorities to problems of Roma who have no identity documents. Since December 9, 2015 advertizing is placed in three cities of the Transcarpatian area: Mukachevo, Uzhgorod and Svaliava. A lot of stereotypes in society concern the attitudes towards members of Roma minority. Have you ever asked yourself why the majority of them have no quality education? Prestigious job? Privatized home? Why are there segregated schools? Why can’t most of Ukrainians treat them kindly? Probably, it is that situation when ignoring is not so painful, as the open anti-Roma treatment. It is known that high percentage of members of Roma minority have no identity documents. Why do they not go and issue them? This is far from being that easy. There is a set of examples of a complicated procedure of obtaining passports. The resident of the Roma settlement in Mukachevo received the passport in one and a half years (!) of court proceedings. Lawyers of Fund “Progress” were engaged in this case. And now imagine a situation when the person has no access to legal aid! Strategy of protection and integration of Roma ethnic minority into the Ukrainian society for the period till 2020 is developed in Ukraine. There are many similar international programs. All this has to facilitate life of Roma, but how can we speak about social changes in their life if people at whose development all these programs are aimed do not exist de jure? Bilateral pressure upon members of Roma minority (horizontal – from the population of Ukraine and vertical – due to legislation collisions from civil servants) results in full isolation of Roma. Trying to leave the zone of comfort to receive documents they quickly come back, at the first stage having faced all “delights” of work of officials. Ignoring legislative collisions by authorities makes independent obtaining identity documents by Roma impossible. They remain isolated from society, without education and work. Unfortunately, very few people think of how it is to live without passport. Absence of identity documents violates all human rights in all fields of activity – beginning with the right to education and finishing with the right to medical care. The child who won’t receive the birth certificate most likely will never receive the passport and respectively, educations, job and opportunity to choose a course of life. 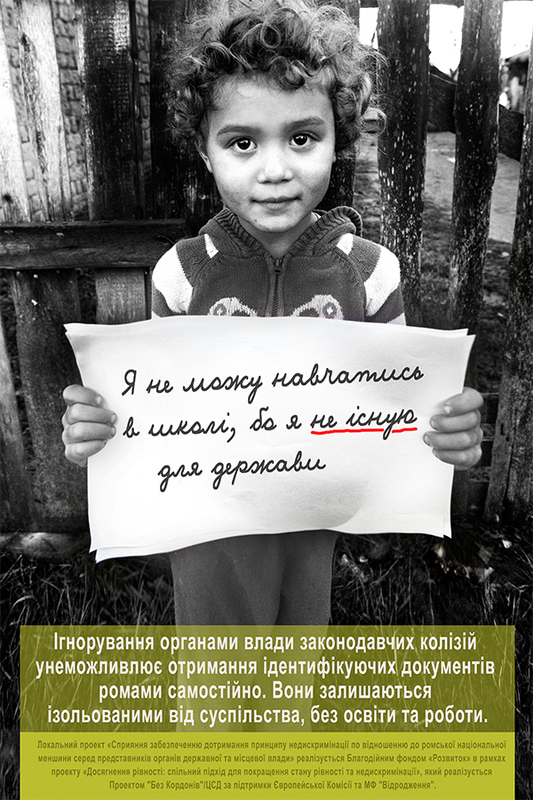 P.S.Local project “Promoting compliance with non-discrimination with regard to the Roma minority among representatives of state and local authorities in Mukachevo” implemented by the Charitable fund “Progress” in the framework of the project “To achieve equality: a common approach to improving equality and non-discrimination”, which is implemented by the project”No Borders” зwith the support of the European Commission and IF «Renaissance». We are team of human rights activists protecting the public interest. We are strengthening the legal possibilities of local communities, and we need your support.